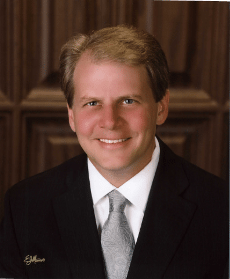 Born and raised in Erie, Pennsylvania, Attorney Michael Koehler earned his Bachelor’s Degree in Business Administration from Gannon University. After attending the Boston University of Law and the University of Pittsburgh School of Law, he received his Juris Doctor degree in 1989. Mr. Koehler served as a Judicial Law Clerk for both the Lawrence County Court of Common Pleas and the Honorable Dante Pellegrini of the Commonwealth Court of Pennsylvania. He returned to Erie in 1992 to enter private practice, where he represented clients in personal injury, vehicle accident, and workers’ compensation cases. In 1995, Mr. Koehler joined Nicholas, Perot, Smith, Koehler & Wall. He became Managing Partner in 1998. Mr. Koehler focuses his practice on representing injured victims in cases involving vehicle accidents, product liability, premises liability, wrongful death, workers’ compensation claims, and Social Security Disability appeals. He is a 20-year member of the Erie County, Pennsylvania and American Bar Associations, and licensed to practice before the U.S. District Court for the Western District of Pennsylvania and the Third Circuit Court of Appeals. He is a former member of the Erie County Convention Center Authority and Erie Port Authority. He assists with a AA travel hockey team based in Cleveland, Ohio, as a Level 4 USA Hockey Coach. Mr. Koehler currently resides in the McKean Township with his wife and three children.